Hope Studios: Are You a Tiger Mother? Do you even want to be? 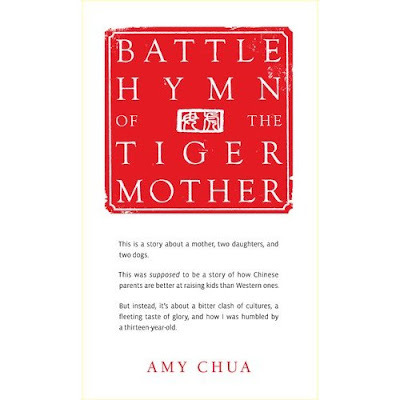 Let's hear from Amy Chua, author of the controversial parenting book, “Battle Hymn of the Tiger Mother”. Why "Tiger Mother"? Amy explains that the tiger is the living symbol of strength and power, generally inspiring fear and respect. Do you agree with this parenting philosophy? Do you believe this parenting philosophy will produce superior children? This is a quote from her book..I have a very real problem with this type of parenting.. I grabbed the card again and flipped it over. I pulled out a pen from my purse and scrawled ‘Happy Birthday Lulu Whoopee!’ I added a big sour face. “What if I gave you this for your birthday Lulu- would you like that? But I would never do that, Lulu. No — I get you magicians and giant slides that cost me hundreds of dollars. I get you huge ice cream cakes shaped like penguins, and I spend half my salary on stupid sticker and erase party favors that everyone just throws away. I work so hard to give you good birthdays! I deserve better than this. So I reject this.” I threw the card back." Hmmmmm, what do you think Moms? I think these kids will have some problems when they grow up. I understand a few of her points, we do tend to accept mediocrity a little too often, but she seems very extreme. PS...I read that her daughter is now 13 and rebelling...that surprises me.....NOT! YIKES...I broke EVERY ONE of her rules and I have 2 beautiful, well adjusted, intelligent adult children and 2 pre adult with no problems so far!! Are you joking? Nope, not happening ~ every rule has been broken and lots of love and cuddling has ensued :) And I for sure don't believe this philosophy will produce superior children. Maybe robotic childeren who need someone else to make their decisions for them. I think I am a little in the middle on this one. I am told by other mothers on occassion that I'm hard on my kids and I can say that, yes, on occassion I am. And I don't stop having those occassions. When they are half assing in life, I let them know it. I feel that is unacceptable. Do I think there are times we need to step back and take a break - absolutely and I allow for that. And when I'm half assing it they let me know and I do better. This woman sounds incredibly controlling. Makes all the decisions for her children rather than fostering a loving environment that teaches them to make decisions on their own. Everything is planned out for them and they just have to follow the schedule and not ask questions and redo what she deems unacceptable, which probably depends on her mood that day. Personally, reading the excerpt from her book that Janet posted pissed me off. How cold and ungrateful for the effort her child made towards her. And to bring up all the things she does for her children and thorw in her face?!! She obviously doesn't parent out of love but rather does things for recognition. I bet if she baked a cake herself, gave a heartfelt hug and I love to you her child it would be their best birthday ever. Hopefully, they get at least one of those. Define "superior children". They may be book smart, but it seems to me that they would be real world stupid. Not to mention having a complete lack of empathy. I'm a messy mom. Kids run in and out of my house. There are projects in various stages of completion through out the kitchen and dining room. And each of my girls have chosen their own separate interest and hobbies. This works for me. Superior, eh? I aim for loving, respectful/respectable and compassionate...superior performance is for automobile engines NOT humans.I've met some incredible people who are very poor spellers! I don't accept mediocrity and often chide my children for slacking when it is blatantly obvious, but at the end of the day I am a loving guide, not a dictator. It is so much healthier to praise children than to tear them down. I could never parent like that but just as I think her parenting style is harsh and cruel I am sure others think mine is permissive and too friendly. Also, I would think that she made things sound worse than they are, after all she wants to sell the book. So I try really hard not to be too "judgey" of other people and their parenting choices, but this woman sounds like a controlling psycho-freak. I feel sorry for her poor children, having to live up to unrealistic expectations and not having a shot at a normal childhood! I think I would rather my kids know that I love them whether get straight A's or straight F's. Their "success" has nothing to do with the way I feel about them. Period. Wanting the best for your child is one thing. Doling out love and affection based on performance is completely different. I am with her on the no sleep over thing...and my kid will learn an instrument (though he will get to pick). Other then that, she can keep her superior children to herself. I got sick to my stomach reading that. It's not parenting. It's controlling and makes a child feel worthless. Parenting should make a child feel accepted, loved, and valued. My most treasured gift was a handful of little pieces of rolled paper on which my then 7 year old had written her favorite memories in sloppy handwriting complete with misspellings and lopsided bows. I keep them in my jewelry box. Never would I thought of correcting her spelling or telling her to take them back and re-write them neater. I typically try very hard to not judge other parenting styles, however, the excerpt from her book made we want to puke and poke her eyeballs out.She may think she is doing great right now by demanding nothing but the best but I'm afraid she is going to have some angry children later in life. As a matter of fact, I hope her children poke her eyeballs out. The author of that book needs some serious therapy!! I laughed out loud when I read Haley's comment. Awesome. From a dad's perspective, I agree with all of you. We've broken those rules and our daughter is fine. And I'm not surprised that the author's own child is now acting up. There's a shock. Not.